It's nigh on impossible to find an 'undiscovered' restaurant in central London. Even places which managed to stay under the radar until fairly recently (the likes of Tayyabs, for example) are now being outed and placed firmly in the spotlight. While we're pleased that so many great restaurants are getting the recognition they deserve, it's all a little bittersweet too: it's becoming harder and harder to find somewhere not visited by the masses. A & C, being types who get kicks out of discovering great places before anyone else, find this all a bit disappointing. With this in mind, we've debated whether we should write this post for some time: in the end, our chance to shout about how good this place is won over our selfish desire to keep it to ourselves. It is nonetheless with some reluctance that we present to you our favourite undiscovered restaurant in London (and, indeed, one of our all-time favourite places to eat): Persian restaurant Mahdi, on the Finchley Road. 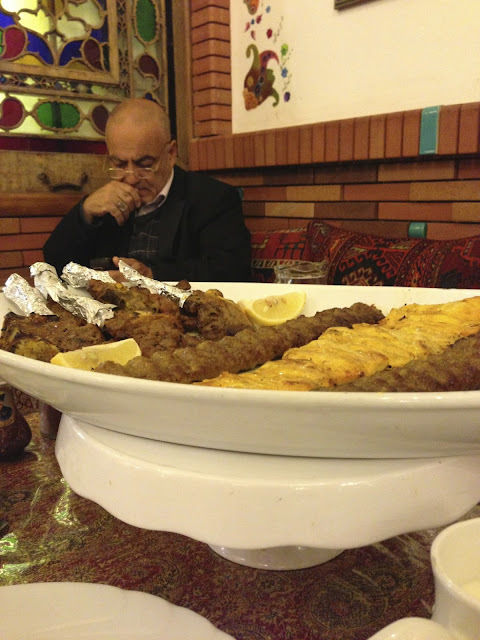 For those regular readers amongst you, it might not come as a surprise to learn that the Mahdi is a Persian joint; it's fairly evident by now how much we appreciate authentic Middle Eastern cuisine, and Iranian flavours in particular. A North Londoner, A was already a regular visitor to the Mahdi when he met C, and first introduced her to the place on a date fairly early on. 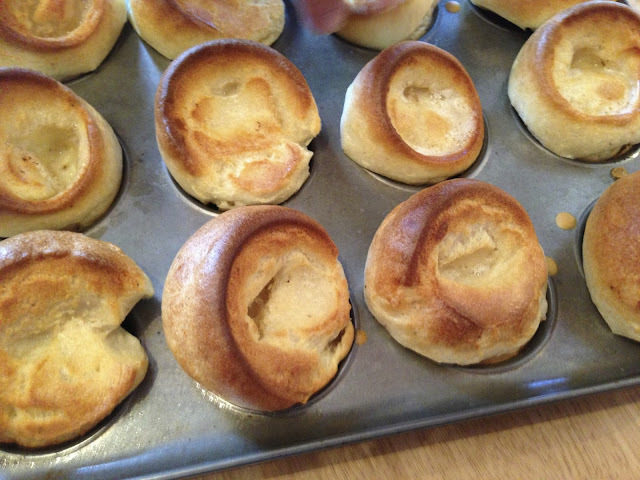 While admittedly a bit of an unusual choice, it earned him major brownie points: C was super impressed, and they've been going back regularly ever since. Although located in a great spot transport-wise - right next to Finchley Road station - it's fair to say that the Mahdi isn't exactly eye-catching from the outside. Don't be dismayed, though, for what it lacks in exuberance on the inside is more than made up for with the interior: think large, garish chandeliers, brightly-coloured stained glass, loud mosaic tiles, paintings of Persian nobility on the walls, leafy plants and a giant samovar in the corner. 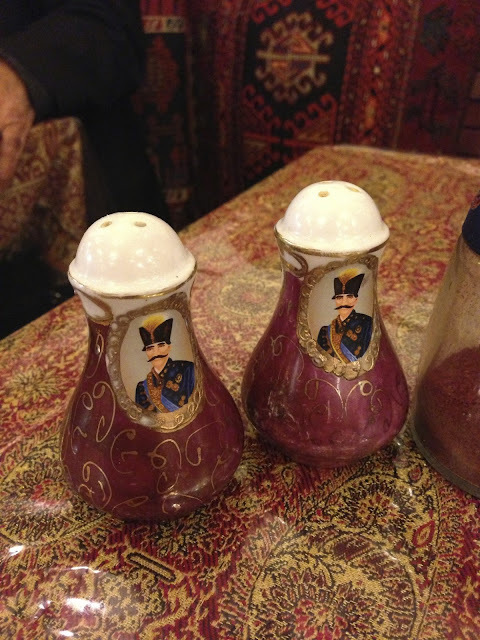 There's Iranian kitsch aplenty here, right down to the salt and pepper pots, decorated with images of moustachioed Middle Eastern men. Authentic music plays in the background, and the same friendly waiters greet you every time with a smile, often appearing genuinely bemused that you're not Iranian and yet have somehow stumbled upon the place. Indeed, most of the clientele are Iranians - either large families gathered around long tables chattering loudly or older men reading newspapers in the corner with pots of tea, conversing occasionally with the owner. Don't be surprised if you're the only non-Iranian diners in the whole place: it's this, along with the décor and the superb food, that make the Mahdi so charmingly authentic. Past experiences have told us that you won't go wrong with whatever you order in here, but A & C are such seasoned locals that we don't even need to look at the menu to know what we want. We start with flatbreads, hummus and an aubergine dish akin to baba ghanoush - all excellent - and then move on to the impressive mixed grill. While it's perhaps not the most authentic sounding dish, it really is superb: four large pieces of thick, tender lamb; one skewer of marinated chicken and two skewers of minced baby lamb, along with four grilled tomatoes, a mountain of rice, a side salad and a tangy Iranian sauce for £22.50. We eat it with more flatbread, too, baked in a wood furnace at the back of the restaurant and comically cut into pieces by the baker with the largest scissors you've ever seen. One mixed grill is more than enough to feed two people: in fact, A keeps joking with his flatmate N that he'll propose a "Mahdi Challenge" to see who can get through the most of the dish on their own (A admits N would probably win). When A & C eat at the Mahdi, they always end up taking home half of the Mixed Grill for leftovers; when you take into account that it lasts not only for one dinner but two for the pair of us, the value here really is unparalleled. 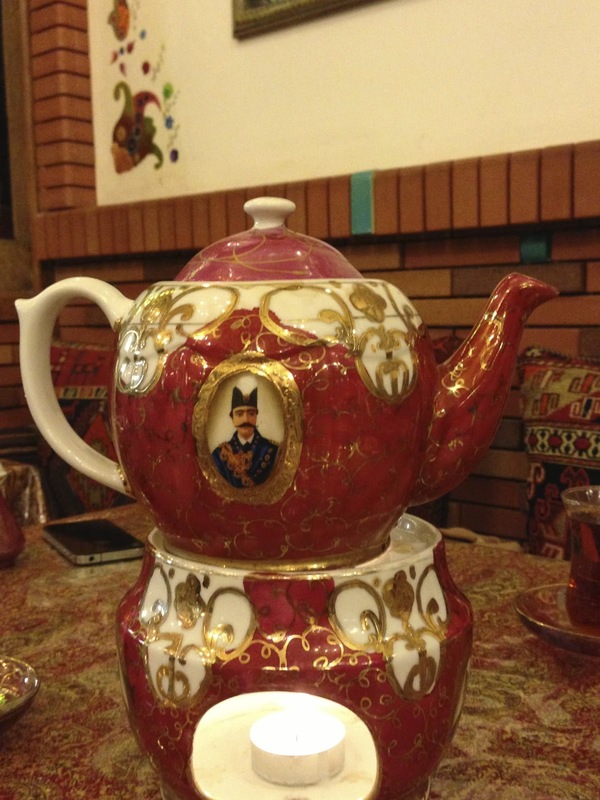 Make sure you don't leave here without having a pot of tea, too; Iranian tea is a little like Turkish tea, except a little sourer, so make sure you add some sugar. It's great, though: refreshing, and the perfect end to a delicious meal.